Windows 7 sports a different desktop look from Windows Vista and Windows XP. Knowing how to get around the Windows 7 desktop is crucial to getting the most out of your computer time; there are many time-saving shortcuts, for example, for opening programs and rearranging open windows. 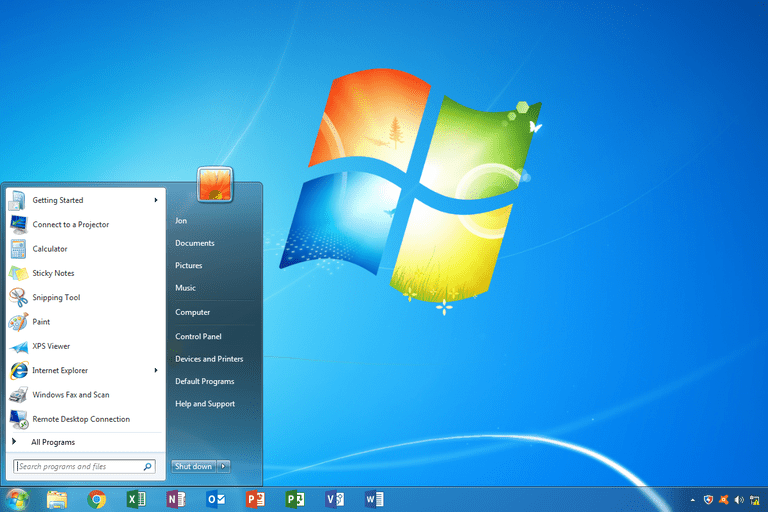 This quick guide shows you the key features of the Windows 7 desktop. Go through these articles, and in no time, you'll be a power user. The new look of Windows 7 is called the "Aero" interface. Here's a little background, along with a description of what Aero means. Aero is not just pretty, but functional as well. Aero Snap, for instance, is a way to automatically move windows to the edges of the screen to compare or enlarge them. Aero Peek gives you a quick view of what's on your desktop. Aero Shake brings the window you want to use to the fore, while minimizing others and uncluttering your desktop. The most important change in the Windows 7 desktop is the addition of the taskbar, which is a shortcut to using your programs. The taskbar is the bottom bar on your computer; it has the Start button on the left, and a group of icons on the right, typically ending with the time and date. Moving programs into and out of the taskbar is as easy as pinning and unpinning them to the taskbar. The taskbar includes a number of new icons on the right as well. The little white flag, for instance, is the Action Center, which alerts you to potential problems. The Action Center updates on you on needed tasks like security issues -- is your firewall on, blocking the bad guys? It also gives information on setting up backups, so your data is safe in the event of a computer disaster that breaks it. The battery meter, which is part of power options, can help your battery last longer. This is obviously only relevant to those using a laptop or device (like the Surface tablet) that runs on battery power. Those of you coming from XP will notice many differences and may wonder what happened to certain desktop items you relied on. In some cases, desktop items were held over from XP but moved around. Shutting down your computer, one of the most basic things you do, has become more complicated in Windows 7. Learn what the new shutdown options do. What happened to XP's "Quick Launch"? It's gone but has been replaced by something much better: the Windows 7 taskbar (discussed earlier), which is significantly superior to Quick Launch. Another commonly-used XP feature was "Show Desktop". Its function hasn't changed, but its look and location has. Windows 7 lets you be you. One of the best ways to do that is to add themes, which are collections of desktop wallpapers, sounds and icon replacements. Gadgets -- mini-programs that sit on your desktop -- were introduced in Vista, but they've been improved in Windows 7. You can also make any image on your computer your desktop background, or wallpaper, with just a few clicks.